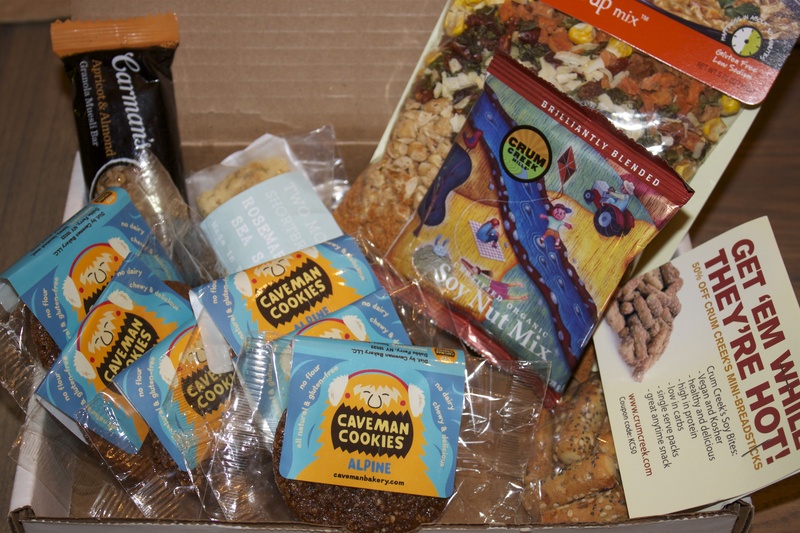 Last month I got Yumvelope Food Box in a mail. This is the other monthly food box that you can order on line. 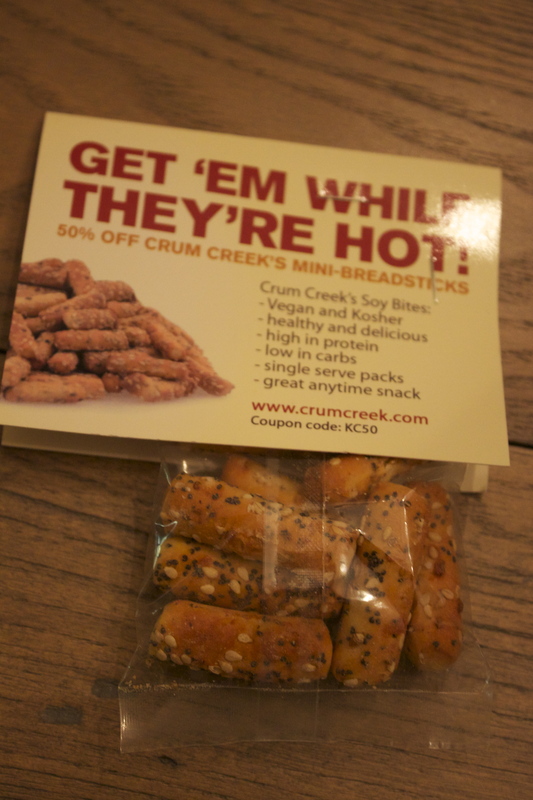 Yumvelope sends out some of the best-tasting artisanal food products to their customers monthly. $21 gets you a large USPS padded envelope sent to you filled with a minimum of six full-size products, including snacks, drinks, desserts, and chocolates. Yumvelopes are the newest way to discover awesome brands and find new favorite products. Be it dutch-process hot cocoa from a small-batch chocolatier or granola baked with Michigan maple syrup, there’s certain to be a product for everyone in each shipment. Unlike “sample” style subscriptions, you will always receive full-size products. Unlike “expensive” style subscriptions, your subscription won’t break the bank! Why I picked this box? All their products seem to be healthy. They send you a lot of products that you can not find in any state. ( I even got one granola bar from Australia). You don’t need to sign up for a year or 3,6 months, you can just try it once and decide if it works for you. 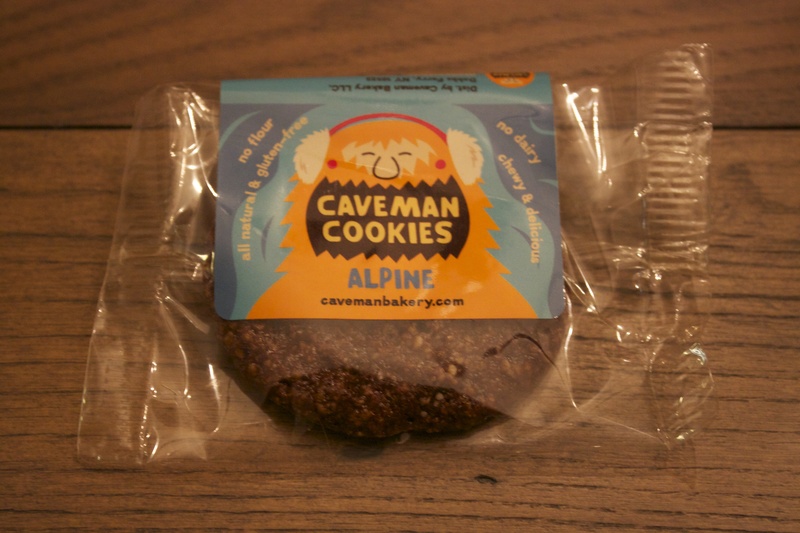 Vegan, gluten free, flour less delicious cookies. The ingredients are very simple: honey, almond meal, hazelnut meal, toasted ground carob. They are really delicious, but you can easily make your own ones at home. There were 5 cookies in the box. These are vegan soy breadsticks. 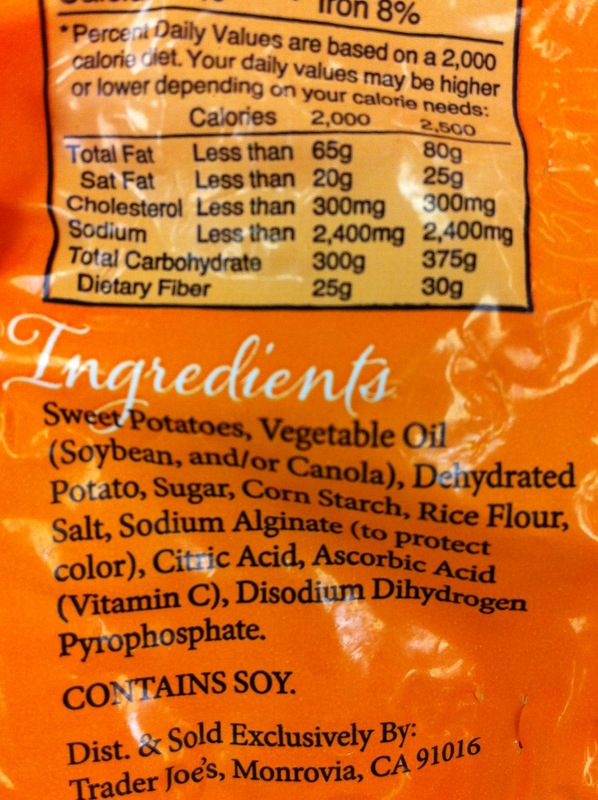 Their ingredients didn’t make me happy: soy oil, wheat flour, corn syrup etc. They taste ok, but probably I wouldn’t pick them at the store. 3. 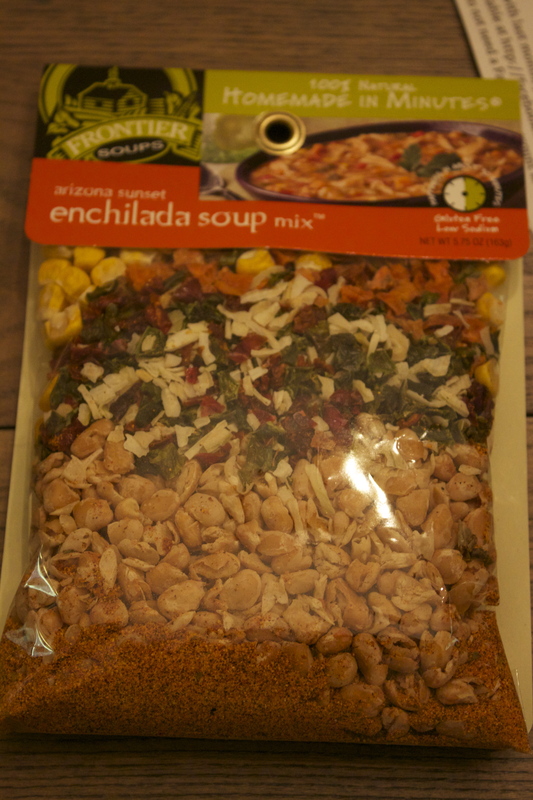 Arizona Sunset Enchilada Soup Mix. I tried these soups before and I liked them. I didn’t make this one yet, but I am planning to make it soon, and I am sure it is as good as the other ones. 4. Crum Creek. 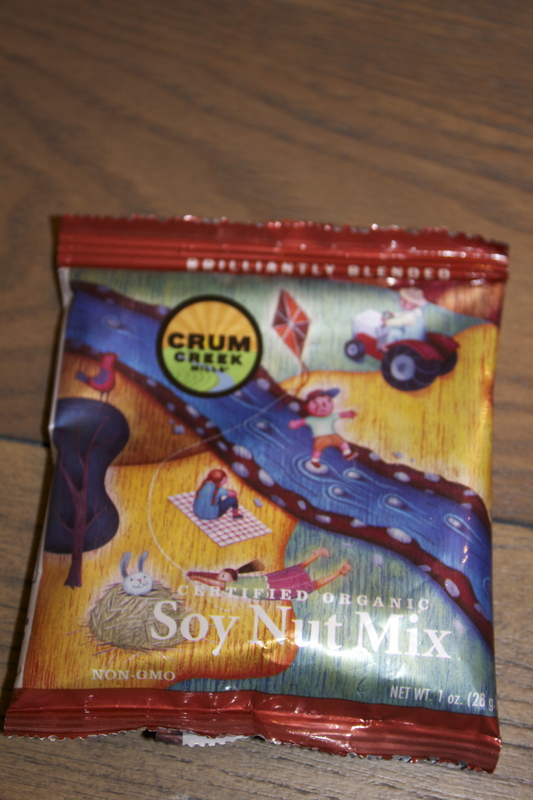 Soy Nut Mix. This is the soy snack, a great alternative for nut-free snack. It is organic, which is important for soy products, and it tastes pretty good. The ingredients are: organic non GMO roasted soybeans, organic chocolate chips, organic sunflower seeds, organic pumpkin seeds, organic raisins, sea salt. 5. 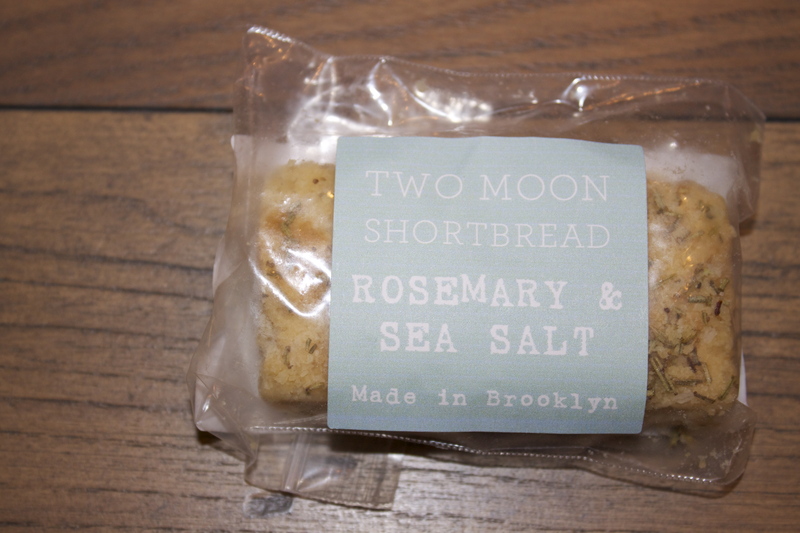 Two Moon Shortbread. Rosemary and Sea salt. This shortbread will work great with the cup of hot soup. It tastes good, but the only reason I won’t buy it anymore: the calories: 165 calories for one serving and this little shortbread has 2 servings. It means this tiny piece of shortbread is 330cal in total, like a bowl of salad. 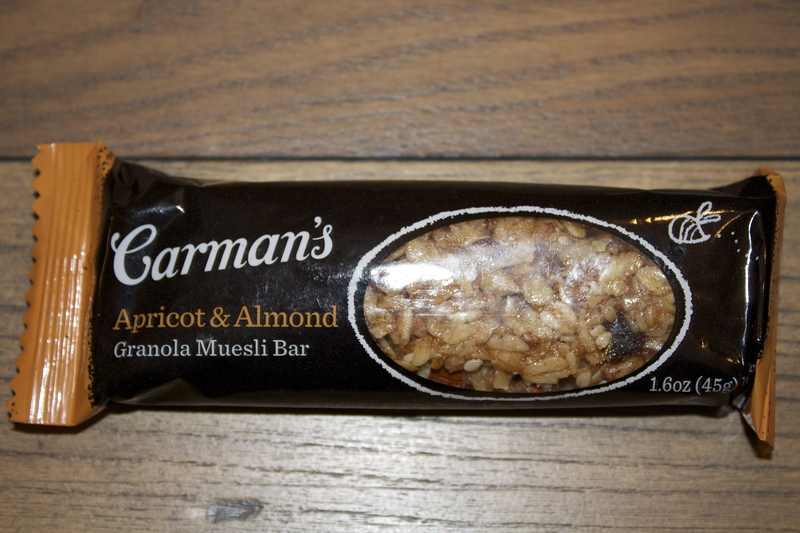 6.Carman’s Kitchen Granola Muesli Bar. The bar is made in Australia, which made it unique for me. It was a full size bar and it tastes as good as the other granola bars. Great snack on the go. In general it was a great experience to try this food box. 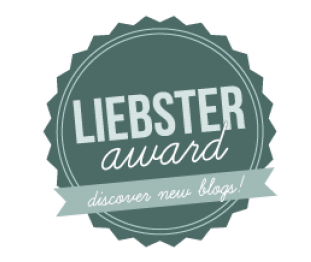 I tried some new foods, that I didn’t tried before, and some of them are in my food list now. Disclaimer: I was not paid to write this post, I paid for this box and all opinions are my own. 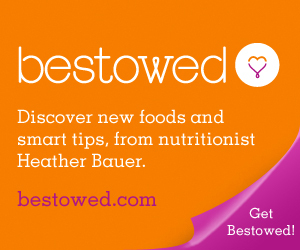 Why sweet potato is better than the regular one? 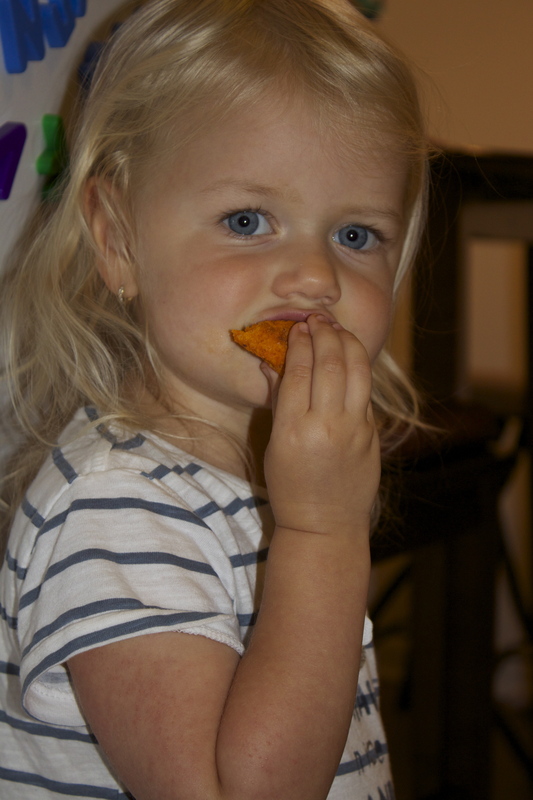 This is the other proof to go with sweet potato. Soy Oil, Corn Starch flash the RED light for me!!!! GMO!!!! The best choice is homemade ones!!!! 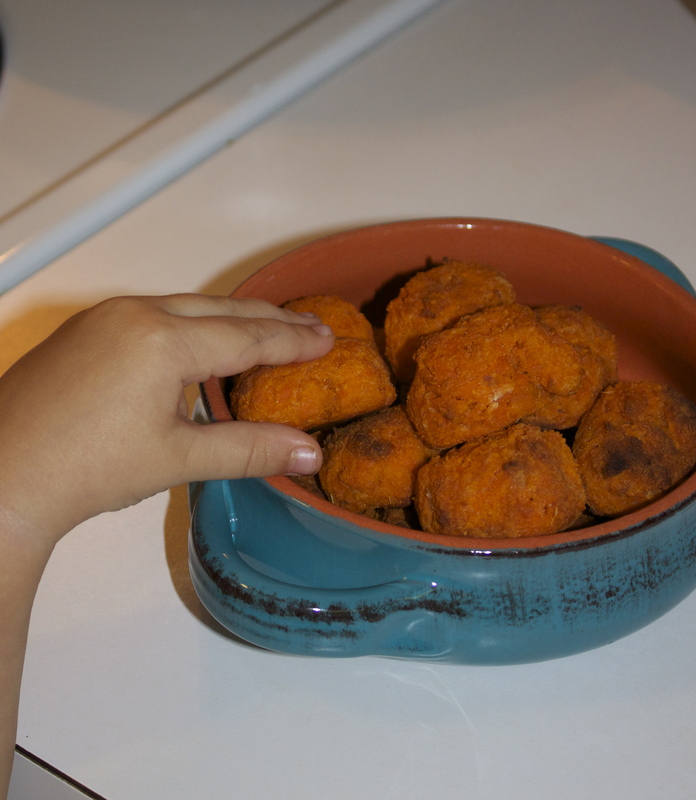 The recipe I am sharing today is a healthy version of potato tots. It’s fat free, gluten free and tastes really good. Add the potatoes to the water and boil for 20 minutes. Once cool enough to handle, peel the potatoes. Shred the peeled potatoes with a box grater. Add the grated sweet potatoes to a large bowl with the flour and salt and garlic. Combine well. 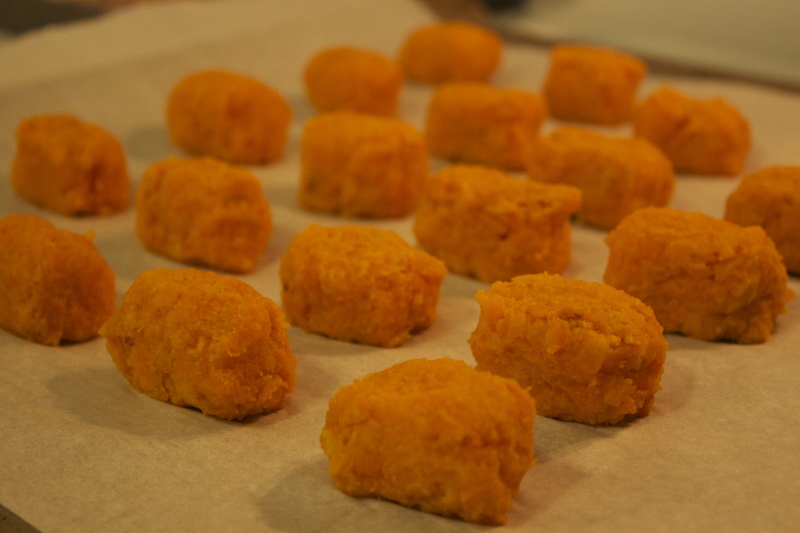 Roll and squish the potatoes into tot shapes. Place them on a baking sheet and into a 375° oven for 30 minutes. Guess who liked them the most? 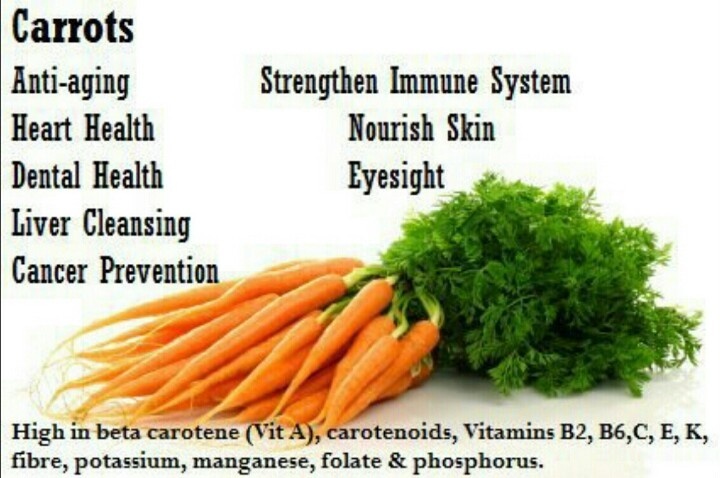 Vibrant orange carrots are a healthy addition to your daily diet. They are low in calories, contain no fat and supply significant doses of certain vitamins and minerals. My other experiment with raw carrots worked great. 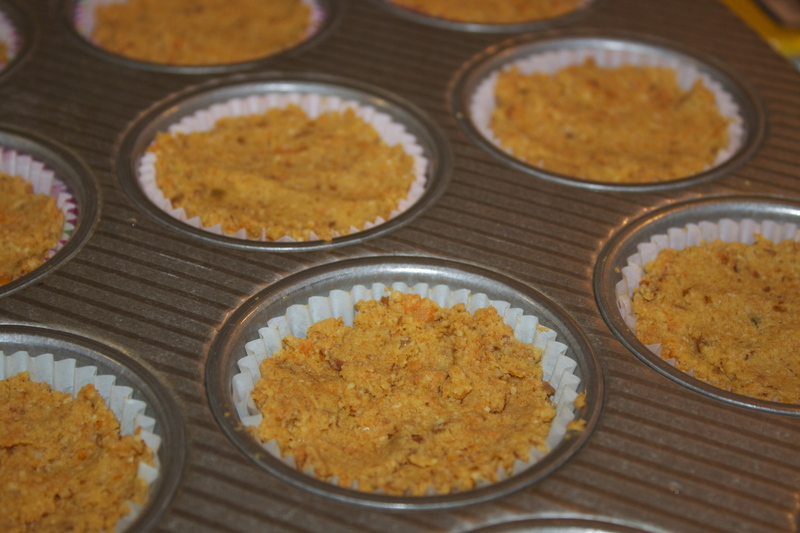 This time I decided to make carrot cupcakes, and used nuts for the dough. 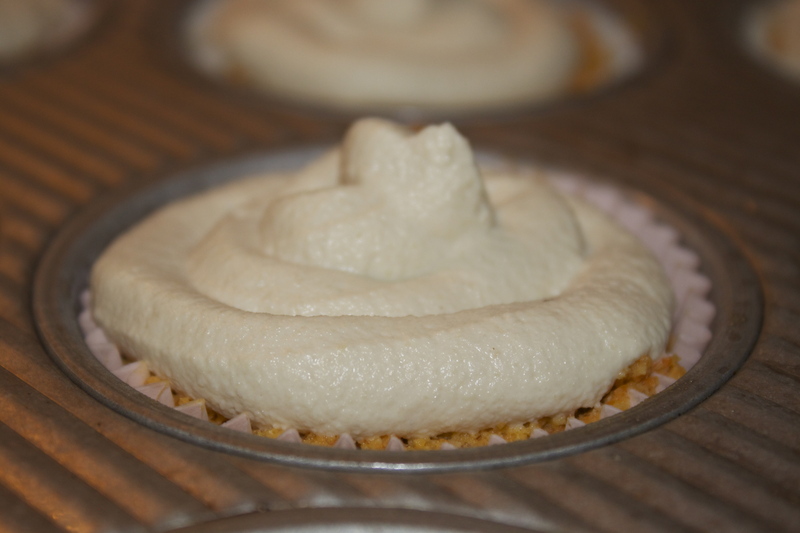 It gave the cupcakes more nutty flavor and made them more moist and juicy. 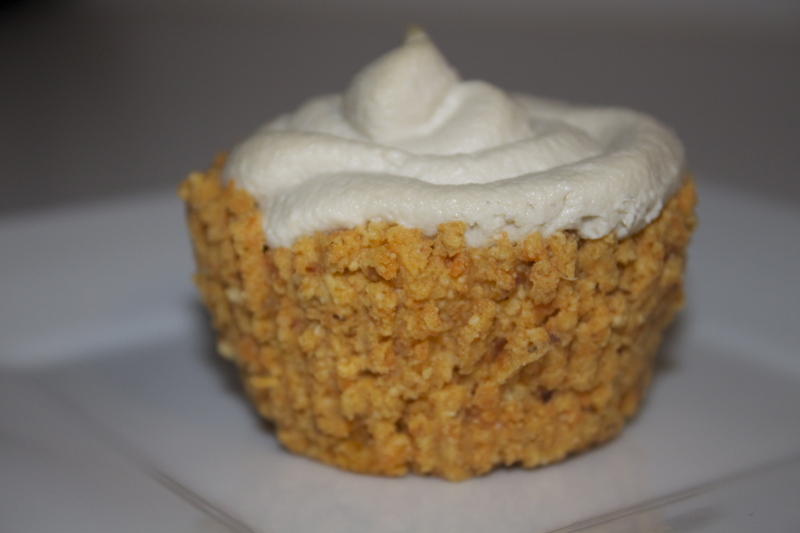 Raw Carrot Cupcakes With Cashew Buttercream. Begin by soaking the almonds (in separate bowls), cashews and dates in filtered water overnight (or 12 hours). In the morning, drain them, and begin working on the icing. Place the drained cashews, juice of 1/2 lemon, vanilla bean (or extract), tiniest pinch of salt and about 3 tablespoons of honey or agave in a blender or food processor. Blend until creamy. Add almond milk, 1 tablespoon at a time, until desired consistency is reached. Add more honey to taste, if necessary. Next, start the cupcake dough. Grate the carrots (about 4 or 5 medium carrots). After you’ve grated them, strain out any liquid (by pressing them into a fine strainer, or wrapping them in a tea towel). Place the almonds in the bowl of a food processor and pulse until coarse. Add the strained carrots, soaked (and drained!) dates, and process again. Add in the cinnamon, vanilla and pinch of sea salt. Add coconut flour. Process until it forms a dough. Grab a muffin pan and place about 1/2 cup of dough in each mold and press down. Once you have 12, pop the pan into the freezer while you get the icing ready to pipe. Pour the icing into a piping bag, then remove the muffin pan from the freezer, invert onto a piece of parchment paper to get them out, and ice. 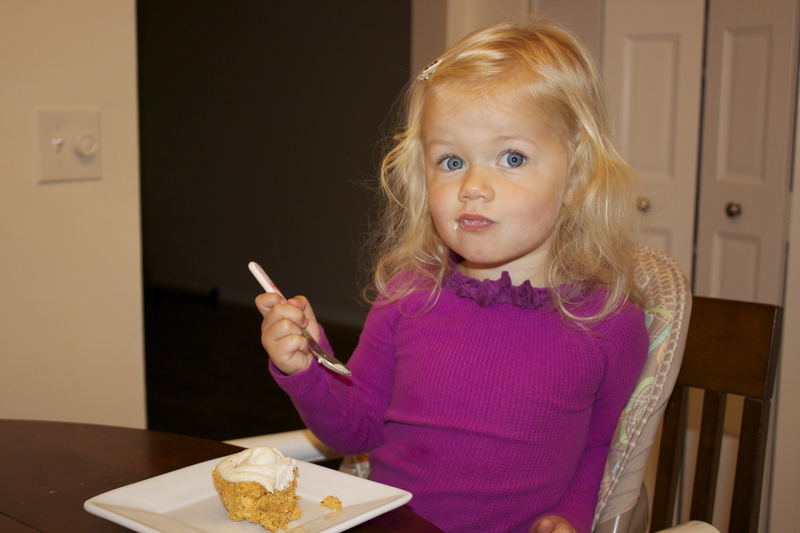 I am probably not the best mom, but I let my daughter have this cupcake for breakfast. Why not? 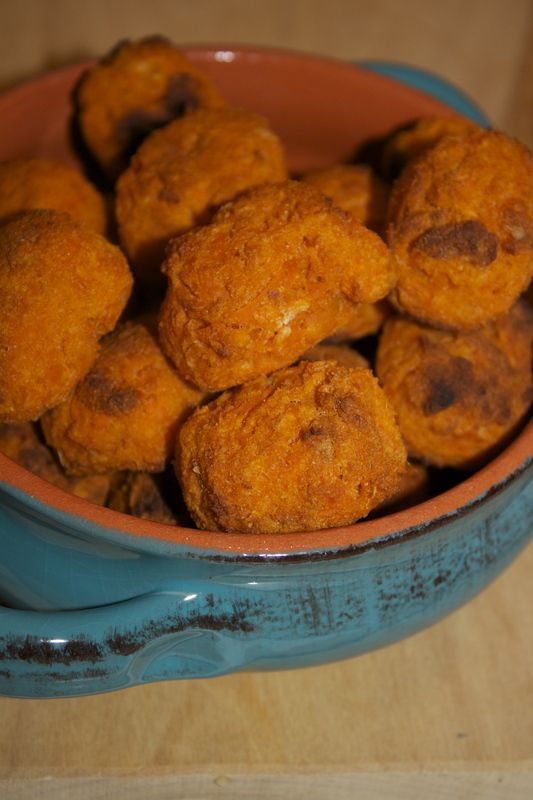 It’s healthy, delicious tiny treat that can work like breakfast sometimes.